We will be closed Easter Sunday on April 21st. Hi, I'd like to show you this page I found on Corner Furniture's website. Keep your table surfaces clear and magazines at hand with this table's built-in magazine storage. Located on the side or back of the table, the magazine rack helps you organize your favorite magazine subscriptions and keeps them close at hand while you sit on your sofa or chair. For those who prefer digital over paper, the rack is a convenient space to store a tablet or e-reader in your living room. Essential in a modern lifestyle with electronic gadgets galore, this end table has a built-in power outlets and USB chargers to keep laptops, cell phones, tablets, and other devices charged and ready to use. By concealing the outlets you can keep cords in check. Perfect for a multi-tasking, modern lifestyle, this chairside end table will become the hub of your living room seating area. 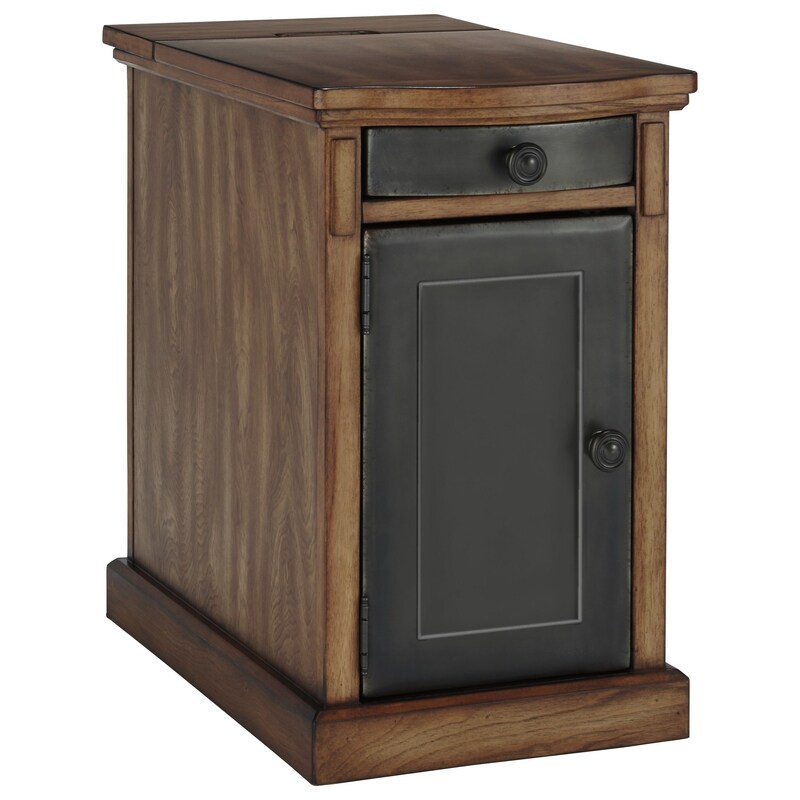 Featuring a metallic aged steel finish drawer and door with light brown wood finish case, this functional occasional cabinet pairs style with utility. It features a flip-up top at the back that opens to reveal three power outlets and USB charging ports for charging laptops, cell phones, and tablets. Additional storage includes a magazine rack on the back, ample storage behind a front door, and a pull-out shelf with recessed two cup holders and remote cubby. The Laflorn Chair Side End Table with Power Outlets & Pull-Out Shelf by Signature Design by Ashley at Corner Furniture in the Bronx, Yonkers, Mount Vernon, White Plains, Manhattan, NYC, New York area. Product availability may vary. Contact us for the most current availability on this product. The Power Chairside End Table collection offers a functional side table for next to your living room's favorite sofa or recliner. With a selection of different styles and finishes, these chairside end tables each feature a flip-up top at the back that opens to reveal power and USB charging ports. Additional storage includes a magazine rack on the back, ample storage behind a front door, and a pull-out shelf with recessed cup holders and remote cubby. The choices are designed to match best-selling entertainment centers. The Laflorn collection is a great option if you are looking for Transitional furniture in the Bronx, Yonkers, Mount Vernon, White Plains, Manhattan, NYC, New York area. Browse other items in the Laflorn collection from Corner Furniture in the Bronx, Yonkers, Mount Vernon, White Plains, Manhattan, NYC, New York area. Visit Our eCircular for Great Deals! Corner Furniture features a great selection of living room, bedroom, dining room, home office, entertainment, accent, furniture, and mattresses, and can help you with your home design and decorating. View recent additions to our online furniture gallery. Corner Furniture offers great quality furniture, at a low price to the Bronx, Westchester, Manhattan, Queens, Western Connecticut, Brooklyn, Harlem, New York City, Brooklyn, Putnam, Orange, Ulster, Dutchess, NYC, Yonkers, White Plains, Eastchester, Scarsdale, Bronxville, Pehlam, Larchmont, Ossining, Harrison, Dobbs Ferry, Tuckahoe area.